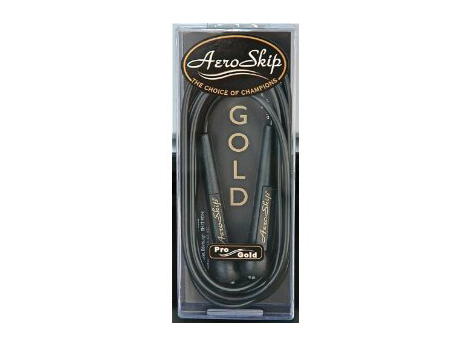 An Aeroskip® Professional Gold Speedrope is a light weight, high performance piece of Professional Sports Equipment. It has been scientifically designed with the application of the most modern materials and technology to ensure maximum Performance, Efficiency and Reliability and therefore maximizing the user’s Health & Fitness benefits. The Speedrope bas an almost ”Friction Free Action” which is achieved by its’ innovative Design and by the addition of our unique coated ‘Speedwasher’ which as the rope is used, coats the inside of the handle with a tine layer from its’ surface which lubricates and constituently adds dramatic enhancement to the ropes performance. Construction – the Pro Gold Speedrope is made from a carefully constructed, balanced and stiffened PVC extrusion which allows supreme performance, feel and maximum (life span and can be used on any surface, even carpeted for Home Workout, unlike leather jump-ropes. The handles shape and performance have been scientifically fashioned from hard wearing Polyethylene and with the end stops being actually chemically bonded to the extrusion it offers not just the best performing, but also the most reliable Jump Rope anywhere in the World today. Likewise, great care has been applied to all safety aspects, in that, you can imagine the potential consequence of one of the heavy traditional maraca style handles slipping from someone’s grasp, as they workout at home or in a class format, in their local Leisure Club or Gym – the damage to property and others doesn’t bear thinking about. Also from a physiological viewpoint – the bigger and heavier the handle the more pressure one must exert, with the consequence of increasing blood pressure – again totally undesirable. Aeroskip® Professional Gold Speedropes now carry the BS5665 & EN71 British & European Standards Certification. Add to all the above, the fact that an Aeroskip® Professional Gold Speedrope far outperforms and outlasts, even the most expensive professional leather rope and is designed for maximum performance on virtually every surface and is presented as a modern and highly attractive package. Now you’ll realise the ‘World of Fitness’ that an Aeroskip® Professional Gold Range Speedrope offers.